Academic Year Starts at the beginning of the fall semester, ends at the close of the spring semester; does not include summer sessions. Accreditation Official certification by an external academic organization that a college, school, or academic unit meets minimum requirements for academic achievement, curriculum, facilities, etc. Add Period Time at the beginning of each semester during which registered students may enroll in additional courses. Articulated General Education Courses UH system courses reviewed by the System-wide Articulation Standing Committees and accepted by campus core/curriculum committees as meeting undergraduate requirements at one or more system campuses. Auditors Regularly admitted students who register, with the consent of the instructor, for informational instruction only and who receive no credit. They do not take course examinations and the extent of their classroom participation is at the instructor�s discretion. Auditors are generally not allowed in art studio, laboratory science, mathematics, elementary and intermediate Hawaiian and foreign languages, creative writing, English composition, physical education, speech and other performance courses or in classes where they might displace credit students. Audit courses are entered on the student�s transcripts with a grade of L and are subject to regular tuition and fee charges. Bachelor�s Degree Undergraduate degree signifying successful completion of the Manoa General Education Core, major, elective, and credit requirements of the University and of an academic unit. Backtracking Completion of a lower-level or prerequisite course after (or while) taking an advanced course. Additional credit and grade points are not awarded for lower-level courses if they are taken after or concurrently with the advanced course for which they are explicitly or implicitly prerequisites. Classified Students (Graduate) Students admitted by the Graduate Division to a program that offers a graduate certificate, or a master�s or doctoral degree. Classified Students (Undergraduate) Students who intend to earn an undergraduate degree and/or are admitted into a degree-granting college or school such as Architecture, Arts and Sciences, Business Administration, Education, Engineering, etc. Community Colleges Campuses within the University of Hawai�i system that usually offer lower division courses and grant two-year degrees and certificates. Conditional Students (Graduate) Students admitted to graduate programs on the condition that they make up academic deficiencies or other requirements within a prescribed period of time. Continuing Students For registration purposes, those who were registered for the previous semester (fall or spring), are in good standing, have not completely withdrawn, have not graduated in their current classification, and intend to register for the upcoming semester. Co-requisite A course which must be taken in conjunction with and at the same time as another course. Co-requisites are indicated in the course descriptions. Core Requirements See General Education Core. Credit Overload (Graduate) For classified graduate students, registration for more than 16 credits (9 credits for graduate assistants) in any one semester. Permission from the graduate dean is required. Credit Overload (Undergraduate) Registration for more than 19 UH Manoa credit hours in any one semester for undergraduate and professional diploma students. Permission from the appropriate college/school dean is required. The request for credit overload is processed during late registration only. Credits (or Semester Credit Hours) Earned after successful completion (pass) of a course. If students fail a course, they have only attempted (but not earned) the credits for the course. Three semester credits are approximately equivalent to three 50-minute meeting periods per week in a 15-week semester. Cross-Listed Courses Courses whose contents are identical and are jointly offered by more than one department. Although the departments and course numbers are different--for example, AMST 354 and MUS 370--these courses are the same. Curriculum All the courses of study offered by the University. May also refer to a particular course of study (major) and the courses in that area. Discipline A branch of knowledge or teaching. Typically refers to an area of study or a major field. Double Major Multiple majors falling under one degree will normally be approved for students who show promise of success in both, provided there is sufficient divergence between the majors. No one course may be used to satisfy more than one major requirement. Drop Period Time at the beginning of each semester during which registered students may drop unwanted courses and not have them appear on their transcripts. Early-Admits Academically superior and accomplished youths under 18 years of age who are continuing high school students admitted to the University to take specific courses for which they are qualified. Electives Courses not designated as part of the General Education Core, college/school, or major requirements. Students should consult their major advisers and college advisers to discuss the selection of electives. Emeriti Faculty Recognition, designation, and privileges given by the UH Board of Regents to faculty members who have retired but still retain ties to the University. Excess Credit Policy (Undergraduate) Students who, by the end of any semester, have earned 24 credit hours beyond those required for graduation and have fulfilled all specific program and University requirements may graduate by action of their college or school. Foreign or Hawaiian Language Requirement (Undergraduate) Successful completion of second-level study (i.e., through 202 or equivalent) of Hawaiian or an approved foreign language for students who entered the UH system in fall 1989 or later. Successful completion of first-level study (i.e., through 102 or equivalent) of Hawaiian or an approved foreign language for students who entered the UH system in fall 1988 or spring 1989. Freshmen Students who have earned fewer than 25 semester credit hours. Full-Time Students For academic purposes, undergraduates carrying 12 or more credits per semester or graduates carrying 8 or more credits. General Education Core Specified courses in liberal arts and related areas required for the bachelor�s degree and usually completed in the first two years of undergraduate study. Grade Point Average (GPA) Determined by first multiplying the number of credits for each course taken for a letter grade by the points earned for that course (i.e., A is 4 points, B is 3, C is 2, D is 1, and F is 0), then by adding all the points, and finally by dividing total grade points by the total number of credits attempted for courses in which letter grades were given. Graduate Assistants Graduate students hired by the University as teaching or research assistants. Graduate Courses Courses offered as part of a graduate degree program, numbered 600-800. Graduate Faculty Members of the University community eligible to advise classified graduate students. Graduate Students Students admitted to the Graduate Division to pursue advanced degrees. GRE (Graduate Record Examination) A standardized test required for admission to many graduate fields of study. Incomplete Grades With the instructor�s approval, students may receive a grade of I if they are unable to complete a small, but important part of a course�s requirements by semester�s end but are committed to doing so by a specified deadline. Introductory Courses All 100-level courses and those 200-level courses without explicit college course prerequisites. Juniors Students who have earned 55-88 semester credit hours. Liberal Studies An undergraduate program within the Colleges of Arts and Sciences that allows students to design their own major. Lower Division Courses Freshman- and sophomore-level courses that generally do not require any prerequisite courses and are numbered 100-299. Major The area of academic concentration or specialization in which the degree is conferred. Maximum Registration No more than 19 credit hours per semester for undergraduate and professional diploma students without special approval from a college dean. Graduate students are limited to 16 credit hours per semester (9 for graduate assistants) unless special approval is given. Minor Limited concentration of courses in an area other than the major and relating to an approved baccalaureate degree. Non-introductory Courses Upper division courses numbered 300 or above or 200-level courses that have explicit college course prerequisites. Part-Time Students For academic purposes, undergraduates carrying fewer than 12 credits per semester, or graduates carrying fewer than 8 credits per semester. Placement Examinations Noncredit tests used to measure a student�s proficiency in a specific subject area in order to determine the appropriate level of courses in which to enroll. Post-baccalaureate Unclassified Students Those who have earned a bachelor�s degree from a regionally accredited college or university and wish to enroll as unclassified students. Pre-professional Programs Programs designed to prepare students to pursue admission into professional programs, such as dentistry, law, medicine, or veterinary medicine. Prerequisite A necessary condition for enrollment in a course. Prerequisites for courses usually consist of a previous course or courses in a related subject and/or the instructor�s consent. Prerequisites are specified in the course descriptions. Residence This word is used in several ways in this Catalog: (1) to denote registration in a regular session (i.e., when a student is �in residence� during the fall or spring semesters); (2) to denote the period of time that a student must be registered at UH Manoa in order to be eligible for graduation (i.e., academic residence); (3) to denote a student�s state of residence (e.g., Hawai�i) to determine if nonresident tuition must be paid (i.e., legal residence); (4) to indicate the student�s place of residence (i.e., living quarters). Residents Individuals at any level of post-graduate medical education in a program accredited by the Accreditation Council for Graduate Medical Education (ACGME). Returning Students Students resuming studies after staying out of school for one semester or longer. Sabbatical A leave of absence granted to University faculty members for research, professional improvement, etc. Seniors Students who have earned 89 or more semester credit hours. Sophomores Students who have earned 25-54 semester credit hours. TOEFL Test of English as a Foreign Language, required of students whose first language is not English. Transcript Official record of courses and grades earned at a secondary or postsecondary institution. Transfer Students Students admitted to UH Manoa who have previously attended another college or university. Tuition Waiver An exemption from the requirement to pay University tuition. Waivers awarded by the University can range from partial to full waivers and do not include student fees.  UH System The state of Hawai�i�s postsecondary education system, comprised of 10 campuses and other research and learning facilities throughout the islands. In addition to UH Manoa, it includes UH Hilo, UH West O�ahu, and the seven campuses of the UH Community Colleges. Unclassified Students Students who have not been accepted into a degree or certificate program but who have been admitted into Outreach College and may enroll in regular credit courses and graduate courses with the permission of the instructor. Undergraduate Students Students who have not earned a bachelor�s degree. Upper Division Courses Junior- and senior-level courses, numbered 300-499, which generally have prerequisites. Variable Credit Courses Courses in which the number of credits to be earned is determined in advance by the student and instructor. Withdrawal Grades Grades of W are given for courses from which the student has officially withdrawn with the approval of the instructor and the student�s college dean. Withdrawals are only approved until the end of the ninth week. Writing-Intensive Courses Courses that put emphasis on written work as part of the regular course of study and are officially designed as �WI� sections. WI sections are identified in each semester�s Schedule of Classes.